Texas' senior U.S. senator, John Cornyn, said the allegations needed to be treated "in a way that is fair to both the individual making the accusation and the judge himself." WASHINGTON – U.S. Sen. Ted Cruz, R-Texas, called Monday on the California professor who has accused U.S. Supreme Court nominee Judge Brett Kavanaugh of sexual assault to testify in public before the Senate Judiciary Committee, as the allegations threw the prospects of Kavanaugh's pending confirmation vote into chaos. Earlier Monday, U.S. Sen. John Cornyn, Texas' senior senator and the second-ranking Republican in the Senate, called for "bipartisan participation" in addressing the allegations but stopped short of calling for Kavanaugh's accuser, California professor Christine Blasey Ford, to testify before the committee in public. By Monday evening, the Senate Judiciary Committee was working to arrange for Ford to speak to the panel as well as hear again from Kavanaugh, according to Politico. At issue is an allegation from Ford, who wrote a letter over the summer accusing Kavanaugh of sexually assaulting her when both were Washington-area high school students in the early 1980s. Over the weekend, Ford came forward publicly in an interview with the Washington Post. Both Cruz and Cornyn sit on the judiciary committee, which oversees judicial nominations and recently concluded hearings on Kavanaugh's nomination to replace Justice Anthony Kennedy. "These allegations are serious and deserve to be treated with respect," Cruz said in a statement. "Professor Ford should have a full opportunity to tell her story before the Judiciary Committee, and Judge Kavanaugh should have a full opportunity to defend himself." Asked late Monday if that meant Cruz believed Ford should testify before the committee in public, Cruz said it did. Cornyn said in a statement that the committee "should treat this with the seriousness it deserves, in a way that is fair to both the individual making the accusation and the judge himself. We can do that through regular order and with bipartisan participation in a spirit of collaboration and concern for all involved." Cornyn, a member of GOP leadership, praised how the committee's chairman, U.S. Sen. Charles Grassley, R-Iowa, was handling the issue: "I applaud Chairman Grassley for immediately initiating the committee process for situations like this, which respects confidentiality." Grassley has called for the committee to follow "standard procedure," which he indicated involved "follow-up calls with relevant parties." Grassley previously stated that he had reached out to his Democratic counterpart on the committee, U.S. Sen. Dianne Feinstein of California, to schedule those calls, and that she declined. 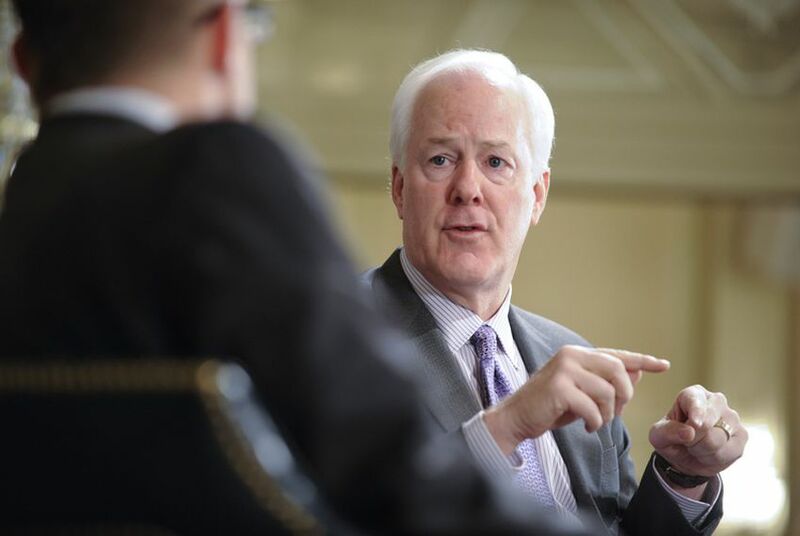 Cornyn further sharply criticized Senate Democrats over the situation. On July 30, Ford wrote a letter to Feinstein accusing Kavanaugh of the assault. The senator then referred the document to the FBI. Feinstein's role in this controversy extends beyond serving as the top Democrat at the center of this controversy: Ford is a California constituent. The point of criticism from Cornyn and other Republicans is that Feinstein became aware of the allegations two months ago but did not raise the matter publicly until last week. Feinstein released a statement last week saying she did not press the matter in the context of the nomination fight in order to maintain Ford's request for confidentiality. The existence of the letter leaked anyway, throwing Kavanaugh's confirmation into doubt. Republicans fiercely criticized Feinstein for not coming forward with the allegation sooner and charged Democrats with arranging for Ford to level her charges at a time for maximum impact. "That hearing should be sooner, rather than later, so the committee can make the best assessment possible of the allegations," Cruz said in his statement.